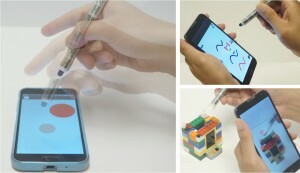 Abstract: We present TMotion, a self-contained 3D input that enables spatial interactions around mobile device using a magnetic sensing technique. We embed a permanent magnet and an inertial measurement unit (IMU) in a stylus. When the stylus moves around the mobile device, we obtain a continuous magnetometer readings. By numerically solving non-linear magnetic field equations with known orientation from IMU, we achieve 3D position tracking with update rate greater than 30Hz. Our experiments evaluated the position tracking accuracy, showing an average error of 4.55mm in the space of 80mmÃ—120mmÃ—100mm. Furthermore, the experiments confirmed the tracking robustness against orientations and dynamic tracings. In task evaluations, we verified the tracking and targeting performance in spatial interactions with users. We demonstrate example applications that highlight TMotion’s interaction capability. Sang Ho Yoon is currently working at Microsoft, Seattle, WA. He received his PhD at Purdue University and his B.S & M.S degrees from Carnegie Mellon University in 2008 with major in Mechanical Engineering and minor in Robotics. He worked at Research Department in LG Display & LG Electronics for 5 years. There, he involved in product development for consumer electronics as well as the futuristic products including ‘Transparent & Public Display’, ‘Assistive/Rehabilitation Robot’, and ‘Smart Car User Interface’. He is particularly interested in applying novel sensing techniques to bring the new forms of input metaphor for Human-computer interaction. Areas of interest include wearable/tangible interface, sensing techniques & fabrication, and novel input device. Currently, his research aims at combining the state-of-art machine learning approaches with novel sensing technique to better support natural human-computer interaction.